Don't you just love short weeks? I had a great, low-key Memorial Day weekend, complete with a mix of girl time, family time, puppy time, and me time. I also was glad to get a fabulous pool day in on Saturday, especially given all the rain we've had this month! With 9.79 inches, this May broke a record set in 1889 when it rained 9.13 inches! Here's to sunshine in June! Today I'm excited to share a favorite recipe with you: Orzo & Spinach Salad with Lemon-Cranberry Vinaigrette. I have been meaning to share this recipe for quite some time, but always forget to take pictures, so y'all are in luck today! I first had this salad during a family luncheon that Bryce's mom hosted. 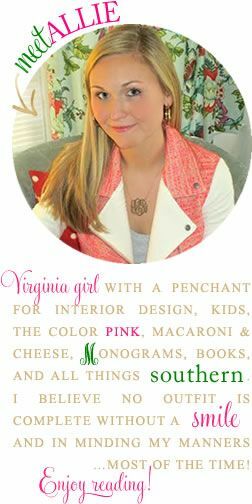 You may notice a trend that many of my favorite recipes are her's. She is an amazing chef and entertainer, so I am always learning as much as I can from her. Since then, it has become a go-to and friends often request that I share the recipe with them! What's even better is that it can be made ahead and served cold...always a plus in my book! It originally comes from the What Can I Bring? Cookbook. Cook the orzo in boiling water uncovered with 1/2 tsp salt over medium-high heat until just done (7-8 min). Meanwhile, place spinach, feta, and cranberries in large mixing bowl and stir to combine. Set aside. Place the lemon zest and juice in a small mixing bowl and gradually whisk in the olive oil, a little at a time, until the lemon dressing thickens slightly. Season with salt and pepper to taste. Drain the orzo well in a fine sieve (orzo is too small and fill fall through holes of a normal colander). Shake the orzo well to remove excess water. Transfer to the bowl with spinach mixture and toss. Pour the lemon dressing over the orzo mixture and toss again to coat well. 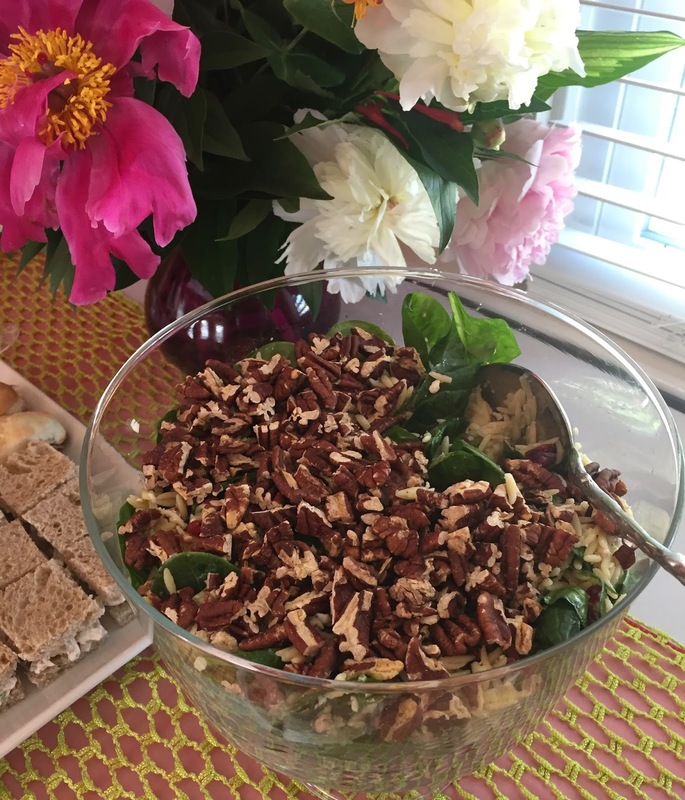 Transfer the salad to a serving bowl and garnish with the chopped pecans right before serving. I last served this for brunch the morning of my cousin's wedding. Since it was a 4:30 wedding and we bridesmaids wouldn't get the chance to eat until probably close to 6:00 pm, my aunt and I decided to cohost brunch in the bridal suite. No surprise, the orzo salad was a big hit! 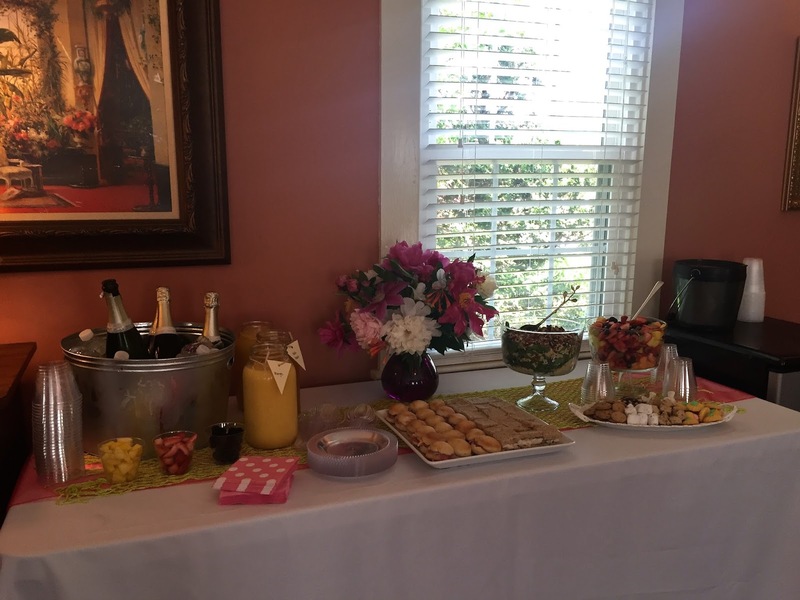 We also served a mimosa bar, fruit salad, pimiento cheese ham biscuits, chicken salad sandwiches, and Westhampton Pastry Shop cookies! Bryce's mom arranged the gorgeous flowers, all fresh cut blooms from her yard! 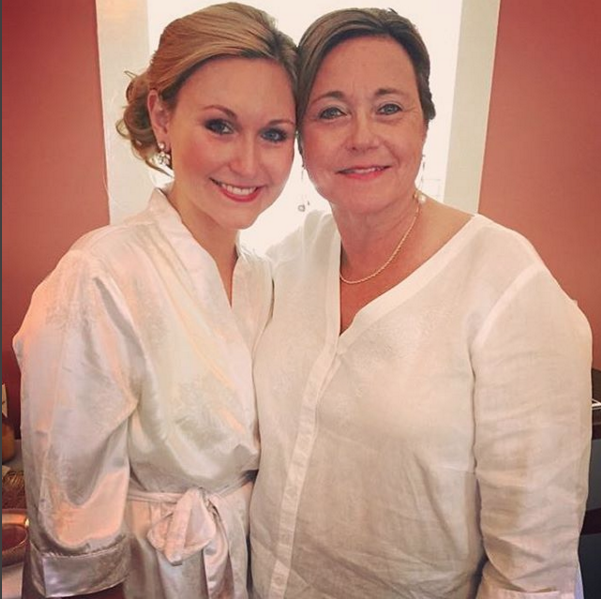 I love this photo a fellow bridesmaid snapped of my mom and I while we got ready that morning! What are your go-to recipes for entertaining? I'd particularly love to know what y'all like to prepare that can be fixed ahead like this recipe! Oh my goodness this sounds heavenly! 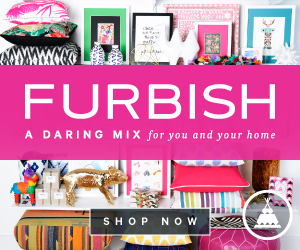 Yum - right up my alley! This looks delicious and perfect for the season! Your setup for the bridesmaids meal is too cute! That recipe sounds delicious! I just had my favorite orzo salad from Fresh Market and was just thinking that I wanted to make more at home- I love the addition of pecans and cranberries! Yum! Keeping this one in mind. The spread looks amazing. I just love that photo of you two! 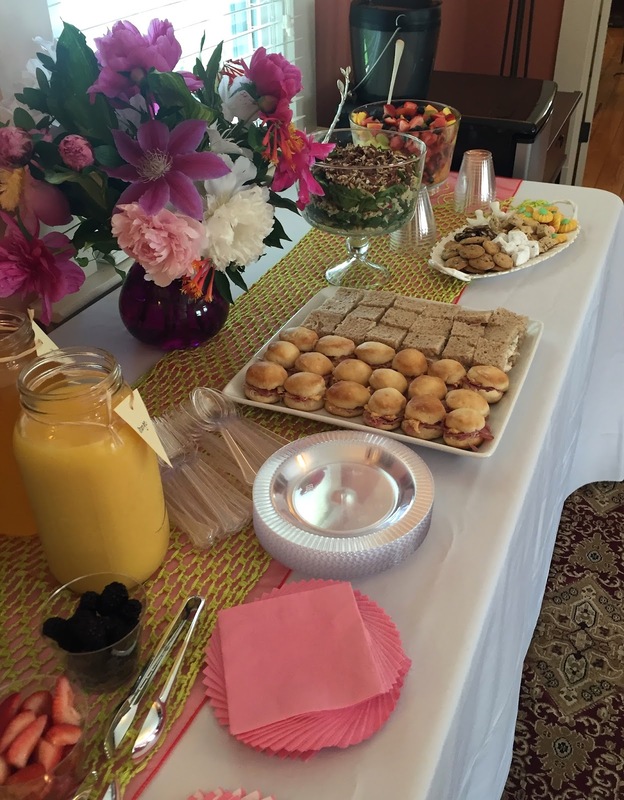 What a pretty set up for the brunch, love those flowers!! I need some salad inspo in my life and this one sound deeeelish!